Before coming back to Paris after my week in Bourgogne I actually went to visit a friend who's in Lyon this spring as an exchange student. And that was the southest I've been so far during my stay here in Paris. 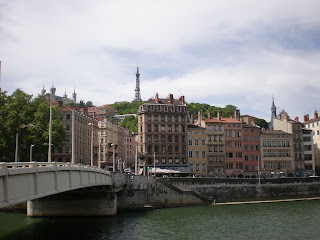 This too was a beautiful city with two rivers, Rhône and Saône, floathing through it and a cosy, small old town. On the picture you can also see the top of the fake Eiffel tower of Lyon. Don't know why they have one :) In the old town there were actually these very cool hidden passages going through the houses from one quartier to another. They were for example used as escaping routes during the world wars. Now it was really cool to walk through them, but I guess it most have been quite scary during the war when there actually was a real danger outside. 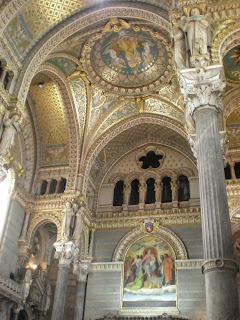 The thing that perhaps impressed me the most, though, was the Basilic Notre-Dame de Fourvière. The interior was really splendid! Filled with beautiful, golden details and not at all like most of the other churches I've seen. I think this was more like an orthodox church than a catholic.